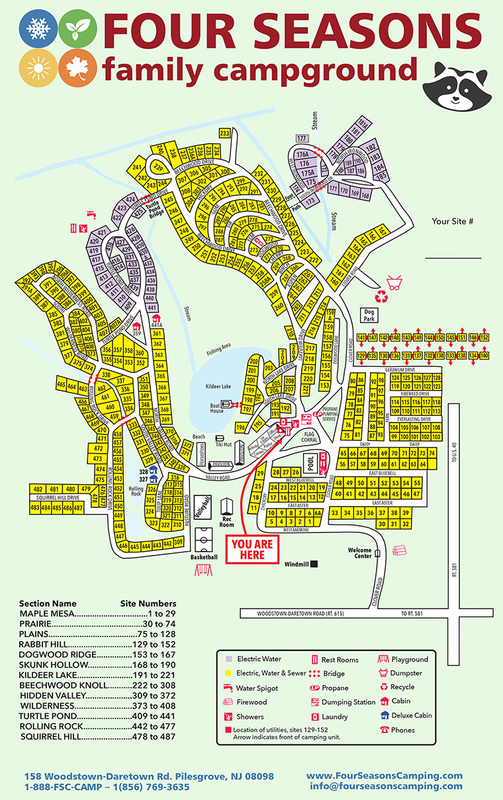 You may click on the map, above, to view and print and enlarged version in PDF format. The following list of rules is for the protection of all our campers. Your cooperation will result in a more enjoyable camping experience for everyone involved. You hereby agree that you understand these rules and will ensure your camping family and guests abide by them so we can all help make this an even better campground. Visitors & Hours: All visitors and guests must register and pay at the gate or office. The fee for each person is $5.00 a day and $10.00 overnight. All visitors and guests shall leave the campground by 10:00PM unless they are paid for overnight. No visitors will be admitted after 10:00PM. Overnight visitors shall leave the campground by 3:00PM the next day. No alcoholic beverages are to be taken off of your campsite. All children under 21 must be at their campsites by curfew, which is 11:00PM. Quiet hours are 11:00PM to 8:00AM. Loud noise at any time is not permitted. No firearms, slingshots, fireworks or similar items allowed. Alcohol: Alcoholic beverages are ONLY permitted on your campsites. Alcohol is NOT permitted in any other part of the campground including, but not limited to, the lake and beach, the pool, the playground or the arcade. You may not walk around the campground with any alcoholic beverages. You may not have any alcohol in your golf cart at any time. Beach, Pool & Other Facilities: All small children must be supervised in the rest rooms, showers, on the playground, at the pool, on the beach, as well as in the Arcade. Parents or grandparents must know where children are at all times and must accompany all children under 12 years of age in the lake or at the pool. Playground equipment and campground facilities are to be used at your own risk. The playground is designed for ages 2 to 10 years and all children on the playground must have adult supervision. Children age 7 and under must be accompanied by a parent in the Arcade. No skateboards allowed in the campground. There is to be no loitering around buildings, or the lake, or the pool, or climbing or sitting on fences or walls. No swimming or boating permitted when the lake is closed. Lake rules are posted in the office. Pool rules are posted around the pool. No private owned boats or canoes allowed in lake. Please help us keep rest rooms clean. No dish washing in the rest rooms. Campsites & Campfires: Subletting or loaning of sites is prohibited. Fires are to be in metal ring provided - barrels are not permitted. No large fires permitted. When fire hazard is extreme, open fires are not permitted. No "sink waste water" to be discharged on ground; it must be connected to the sewer or caught in a container. Only one table and one fire ring per campsite. All outside refrigerators must be locked at all times. Nails in trees, cutting of trees, shrubs, etc., are strictly forbidden. State law prohibits burning of garbage and trash. No washing of trailers, vehicles, boats, watering grass, etc. No pools or playground equipment of any type allowed. You must maintain 3 feet of unobstructed clearance completely around the electrical pedestal. Pets & Wildlife: All pets must be tied or on a leash at all times. The only exception to this is within the Dog Park. Dog Park rules are posted at the Dog Park. You must clean up after your pet throughout the campground including on your site and dispose of all waste in a trash receptacle. No pet is to be left unattended. Excessive barking of dogs will not be tolerated. No pets in lake, on beach or in buildings. All dogs must be registered with the office and proof of current rabies shots presented. No throwing stones at our ducks, rabbits, squirrels, or any other wildlife. They are an attraction at our camp; we want to keep them healthy and alive. Telephone & Mail: A pay phone is available for your use outside the campground store; it is for outgoing calls only and will not receive any incoming calls. Outgoing mail containers are located in the Camp Office. Vehicles: CAMPGROUND SPEED LIMIT: ten (10) miles per hour – this applies to golf carts as well. You may not drive around the speed bumps into the grass at any time. This applies to all motorized vehicles including golf carts. Seasonal car decals must be attached to your vehicle and all occupants must show their ID card to the person at the Welcome Center each time of entry. All other campers must display their car pass hanging from their rearview mirror at all times while in the campground. Only two vehicles are permitted per site and they must be parked on the site. Vehicles will not be parked on any roadways or other sites. All vehcles must be registered at the office or Welcome Center. We request you use your vehicle as little s possible to minimize traffic, especially at night. No parking at the pavilion or the arcade. Motorized bikes/scooters (of any kind) are not permitted in the camp. No bicycle riding after 8:00 P.M. or dusk, whichever comes first. By State Law, children ages 14 and under are required to wear a bicycle helmet at all times while riding in the campground. No bicycle riding in any buildings or pavilions. No boats/boat trailers or vehicles are to be left in the campground from November 1 to April 1. Electric golf carts are permitted for fee and these must be in conformance with the golf cart requirements and registered annually with the campground. Sheds, Decks and Platforms: THE CAMP OFFICE MUST FIRST APPROVE ALL SHEDS AND REPAIRS TO THE SAME IN WRITING IN ADVANCE. Only one shed is permitted on a site. Only sheds from our authorized company are permitted in the campground. There will be no decks, porches, platforms, or other structures or construction on your site. Trash and Recycling: Everyone is responsible for placing their garbage and non-recyclables in the trash dumpsters located in the campground. Recycling is mandatory in New Jersey. Please refer to our trash and recycling sheet for details. We are not responsible for any loss due to fire, accident or theft or any act beyond our control. This campground is private property. Any individual found destroying or damaging campground property will be expected to make due restitution. Violation of any of these rules and regulations, or unreasonable or objectionable conduct, is cause for termination of tenancy or visit. We, as owners, reserve the right to make decisions in such matters. Please do not drive to the pool - there is no parking available. Absolutely no alcohol in the pool area. Glass containers are not permitted in the pool area. There is no lifeguard on duty - you are swimming at your own risk. No smoking in the pool area. This includes within the pool fenced area as well as the area immediately around the outside of the fence. No floatation devices are allowed in the pool area. This includes all inflatables, pool noodles, etc. The little armband “swimmies” for very young children are permitted to be used as long as an adult is swimming with the child. You can still use floats in the lake if you wish. Currently there are no chairs or lounges provided so please feel free to bring your own chair or blanket to sit on. If you have an umbrella that fits on your chair or is self-standing you may bring that as well. No running around the pool or diving into the pool. The main entry gate is on the end of the pool towards the lake - please use that to enter and exit the pool. There is also a gate at the end towards the bathhouse - please use that to use the restroom and showers. Please do not put any chairs into the pool, especially on the sun decks toward the lake side of the pool. These sun decks are for you to just sin in for a shallow water expereince or to have your little guys and girls enjoy putting their feet into the water. This pool is closed when the owner and operator is not on the premises. The pool hours are 9:00AM - 7:00PM unless otherwise noted. Any person showing evidence of any communicable skin disease, sore or inflamed eyes, cold, nasal or ear discharges, open blisters, chuts, or bandages shall be denied admission. All children must wear diapers specially designed for immersion in water (such as swimming diapers). Do not wash out soiled diapers in the bathing water. Children should be encouraged to use the restroom before entering the water. Immediately report any "accidents" you observe in the bathing waters to a pool attendant or the Camp Office. No animals, except for service animals, shall be allowed in the swimming pool dressing rooms, or other parts of the enclosure. No animals are permitted in the pool. All persons shall shower before entering the water. Conduct which endangers the safety and comfort of others is prohibited. Outdoor bathing is prohibited during an electrical storm.